Dryer Vent Cleaning saves lives! Did you know that clothes dryer vents clogged with lint are the leading cause of household fires? Vents collect dirt, dander, dust and other contaminants each time you run your dryer. Brian uses a specialized vacuum air sweep system to clean the lint and debris from inside the vent. The result of dryer vent cleaning is a home safer from fire, shorter drying times for your clothes and lower energy bills. Although few people realize it, clean dryer vents are actually beneficial to have, and make you safer from fire in the home. 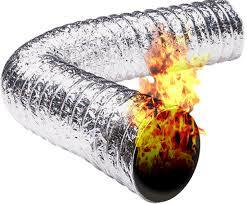 Dryer vent cleaning ensures lower energy costs, as well as make your home safer from fire hazards. This is because your lint trap traps about 60% of the lint, the other 40% goes up and through your dryer vent and dryer vent system. The accumulation of lint in the dryer vent or dryer vent system is a fire hazard. An important fact to remember is that 98% of your dryer vent cannot be seen by the property owner. The only part that is visible is the dryer exhaust, transition hose and the roof exhaust vent or exterior wall vent on some multi-story dwellings. The vast majority of the dryer vent is in a confined area, a confined area would be inside your walls, floor joist, crawl space and attic. A lot of times what you do not see, you forget about. A confined area is a problem for another reason also. When a fire starts or extends into a confined area or space it may not be noticed as quickly as a fire in an open area. If your dwelling or property has a sprinkler system it will NOT reach a confined area or space.